Ever notice in old classic movies how distracting fake scenery looks outside, say, a car that actors are supposedly traveling in? Well, that’s true in landscaping as well. 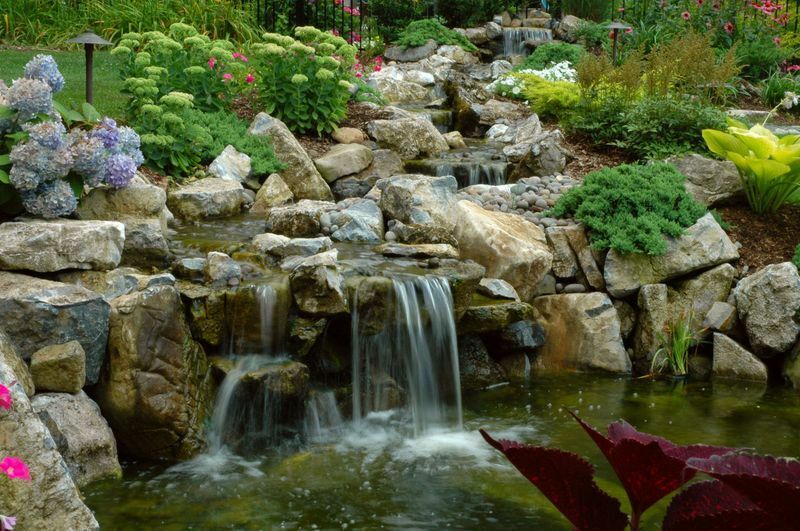 Creating a serene outdoor scene that looks natural — like Mother Nature sculpted it — requires knowing what elements will make it appear genuine. For example, whenever we design and build a new water feature or landscape wall, moss rock is always part of the design. 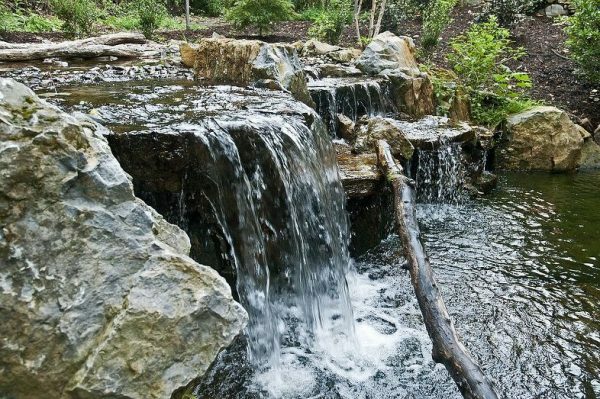 “Deck and Patio finds that these sandstone or flagstone rocks, with their red and brown undertones, provide the ‘mountain stream-woodsy appeal’ that is key to any natural looking water feature and surrounding landscaped garden,” says owner Dave Stockwell. Moss grows well in shady areas, Dave adds. And along with ferns, it helps transform any backyard into a natural cool setting. “Of course, choosing the right size rocks and knowing where to position them is also key to creating a natural-looking scene. 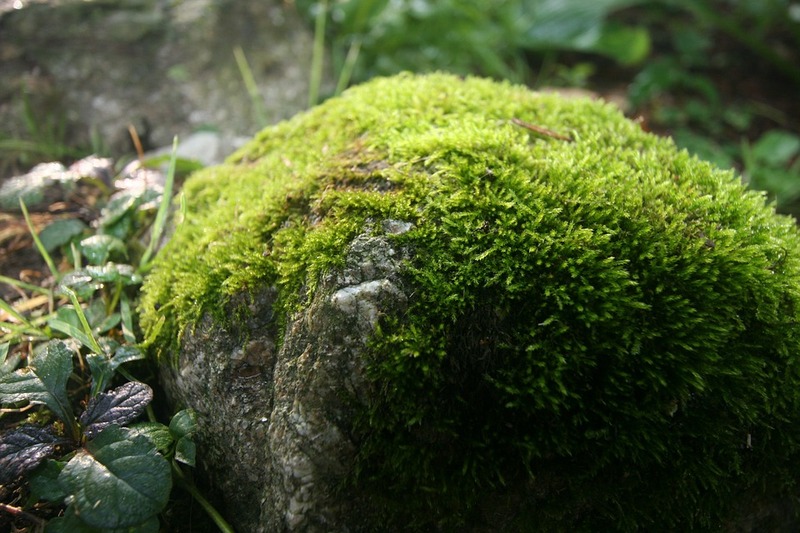 Moss rocks are harvested from quarries nationwide; later moss is added. 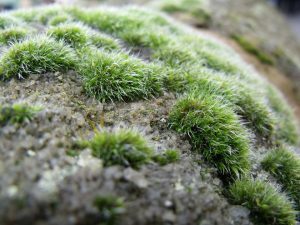 While the moss on the rocks do not flower, the initial planting reproduces through its tiny spores, absorbing water and nutrients through their foliage. 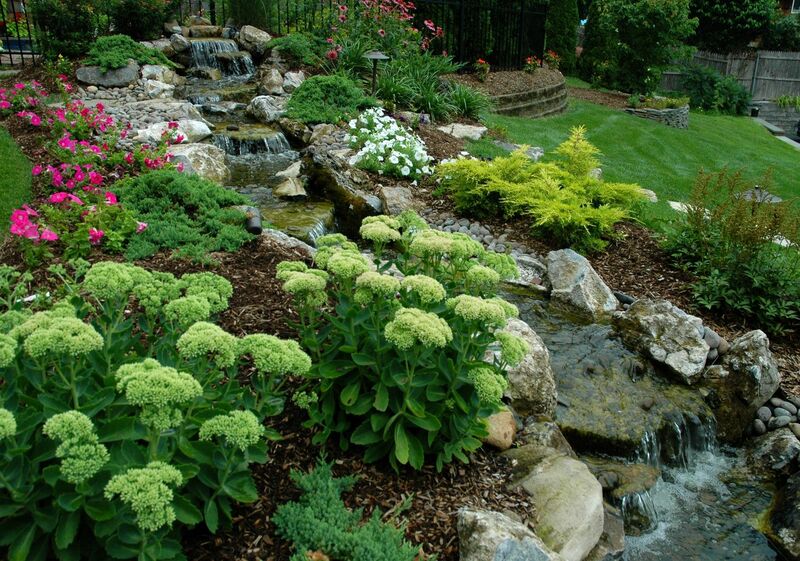 The only requirement for healthy growth is the moist conditions derived from water features or other sources. For our first project showcased below, Deck and Patio added tall grasses and evergreens like Juniper Parsoni, to complete the rich, lush, green backdrop to see. Coneflowers and Spirea Anthony Waterers help bring in the bright bursts of color. During winter months, the moss rock boulders themselves form breathtaking ice sculptures that extend enjoyment of the water feature. 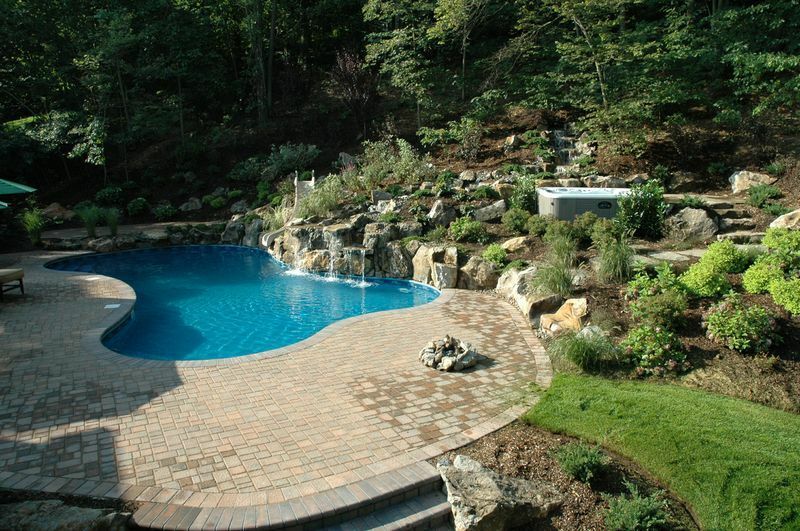 In addition (see immediate photo above), moss rock steps leading to a small blue stone patio became part of Deck and Patio’s overall design. Plus, a portable hot tub was installed on a flattened area in front of the patio. It was very important to them that any new deck and railing would embrace, and not block, their lovely backyard water views. 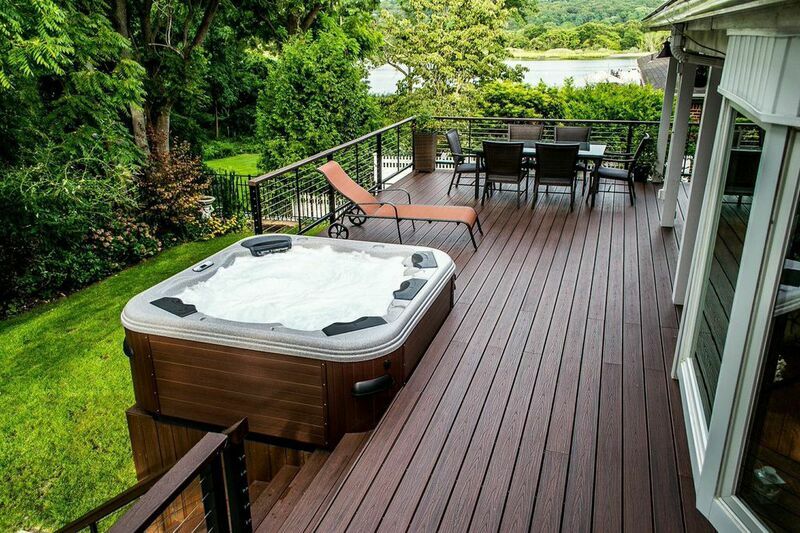 Regarding the hot tub, they wanted it to blend well with the deck, and that the complete outdoor area be maintenance-free as well as elegant. Our team also helped them choose a maintenance-free encasement for their new Bullfrog Spa; it coordinates handsomely with the Trex Transcend deck planks. 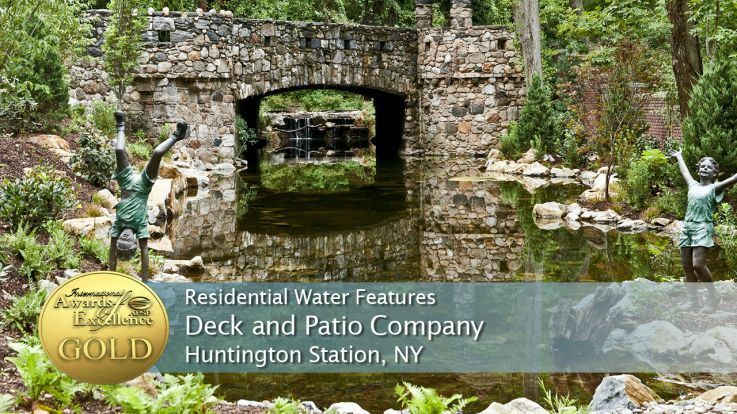 This project won The Deck and Patio Company a prestigious 2014 Merit award from the Northeast Spa & Pool Association (NESPA). Trex “Lava Rock” Transend decking and CableRail by Feeney together offer not only the sleek look the homeowners wanted, but the cable infills do not obstruct views from any position. 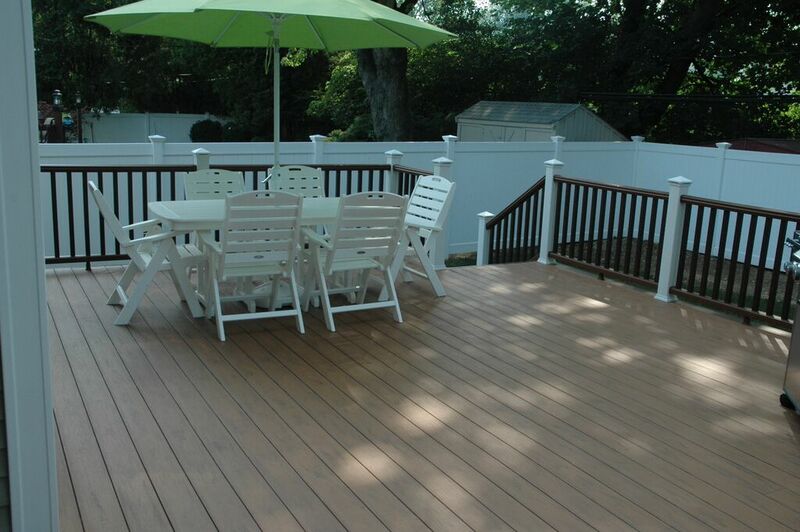 The rail caps are Trex Deck board chosen to match the decking; the railing infills are CableRail by Feeney and the balusters part of Feeney’s Designer Rail system. Whether it’s from the hot tub, or the dining and lounge areas, the deck is an ideal spot to appreciate the property and location. Deck and Patio helped the homeowners choose the right-sized portable spa and integrated it into the new deck, partly by adding a spa encasement of mahogany PVC boards that look like wood, but, like the deck material, will not rot, and which suggest a modern, rich and upscale look. It was important that when the clients sat on their new deck, the railing infill (here made of stainless steel) did not spoil their exquisite views. 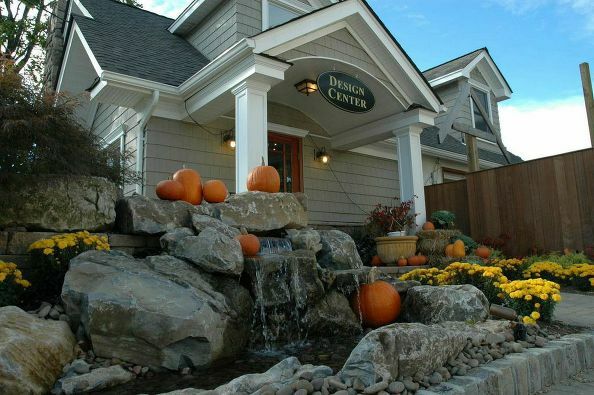 Set high on a platform, the spa is conveniently located just steps out their back door, ensuring they will use the spa even during snowy and cold winters — something these homeowners especially wanted. It is a common myth that you can’t leave your pond fish outside once the cold sets in. Actually, fish do just fine during winter. 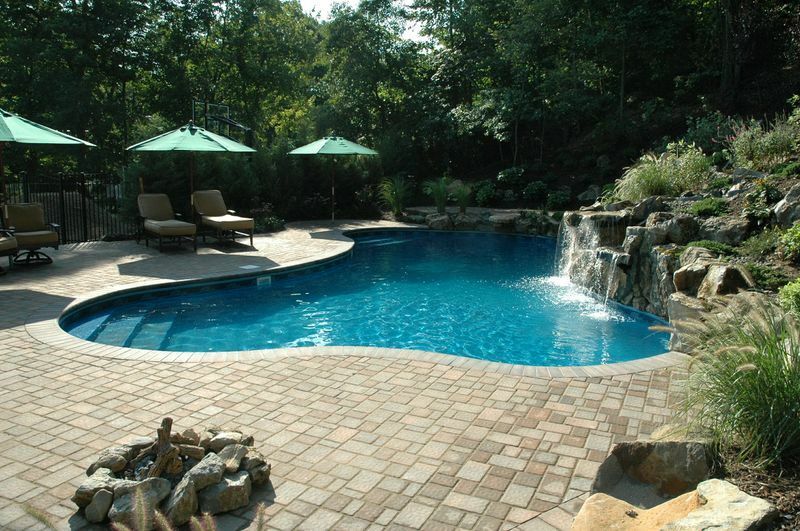 That said, Deck and Patio’s Outdoor Living Expert, Bill Renter, does caution to be alert. 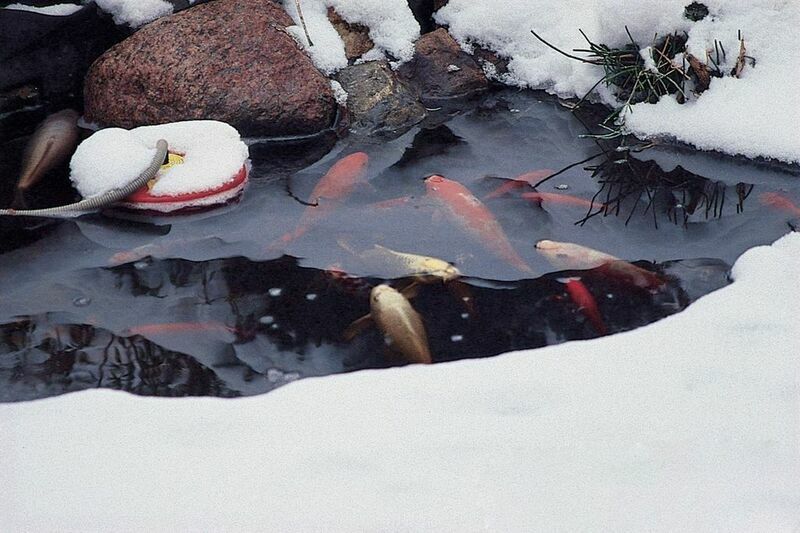 When ice covers the pond, the fish might not be getting enough oxygen. and keep a hole in the ice with a heater, bubbler and an aerator. 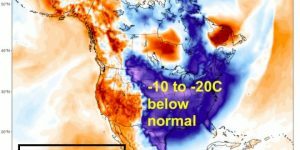 This allows the naturally produced gasses to escape from under the ice. 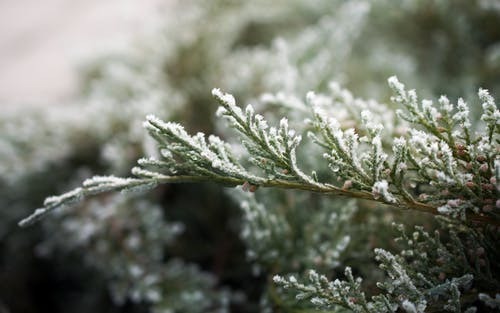 Before winter sets in, carefully look over your plant material and remove dying plant material. 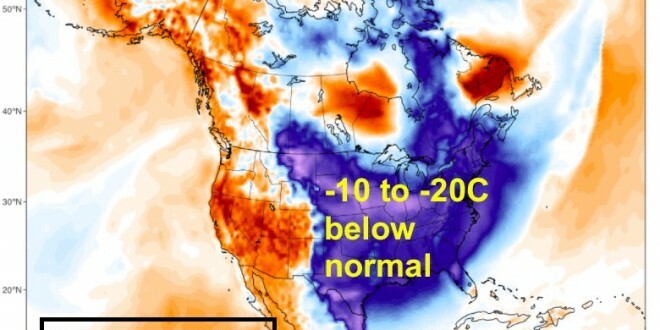 These materials rot and build up poisonous gases that can’t escape through ice when it forms. 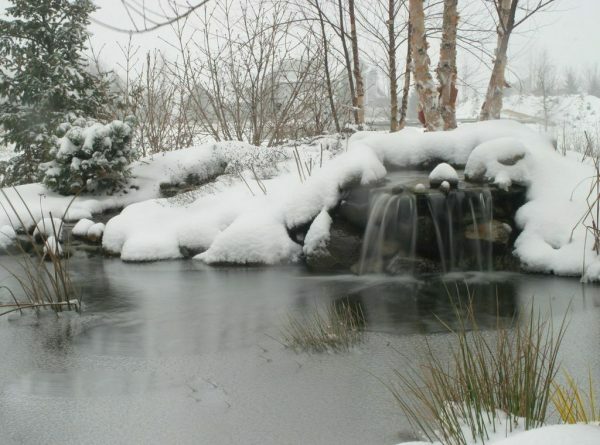 Such conditions might mean the koi are no longer simply hibernating, but are in a dangerous state of torpor. Keeping any waterfalls running during cold months helps move the water so ice doesn’t form. 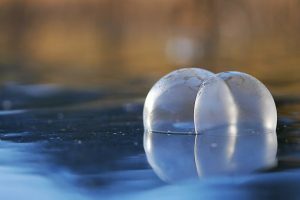 But if ice builds up, pond aerators can put bubbles back in the water to add oxygen for the fish. Hardy water lilies (shown here) that float on the water’s surface and have a short blooming period can withstand the cold winter months nicely. Lotuses also can withstand the cold winter months because they bloom in summer and go dormant in winter. Note that frost kills water hyacinths; water lettuce, which fights algae, should be wintered in a warm spot that is well lighted as they will not survive in the pond over winter. To be on the safe side, take water temperature regularly once it hits 55 or lower. If your pond jewels are hungry and moving about and you haven’t fed them, they will find something in the pond to eat and soon will be dormant anyway. Ask your pond designer/builder to create a small cave, or caves, where the fish can hide and also lay dormant during the winter months. 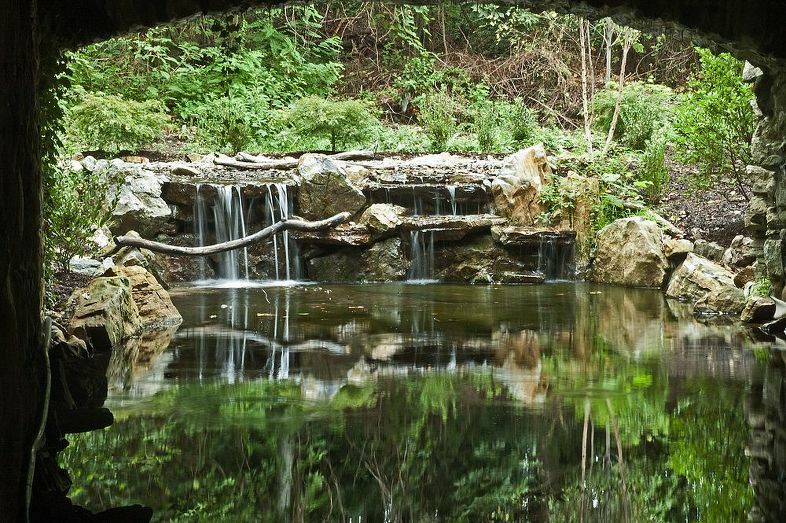 Caves are easily made from the way rocks are positioned in and around the pond. 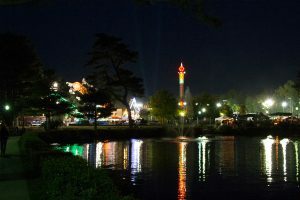 At one time, enjoying something as relaxing and restful as reflections in a pond was occasioned by a lake-side holiday or visit to the mountains. However, with the growth in popularity of backyard escapes/oases, homeowners, in increasing numbers, are bringing that experience home. Indeed, there is something mystical and restive in pausing alongside pristine still water. It is especially restorative to study the reflections of the surroundings that such water throws back — including distant delights like the clouds and the moon. 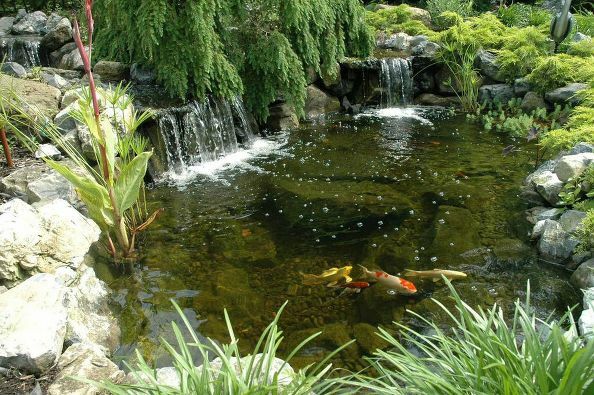 As a student of nature and avid outdoor enthusiast, Deck and Patio’s Outdoor Living Expert, Bill Renter, believes that water features such as man-made ponds, when correctly designed, positioned, and constructed, can provide a transforming experience in one’s life: a ‘little world all to oneself’ to paraphrase Thoreau. 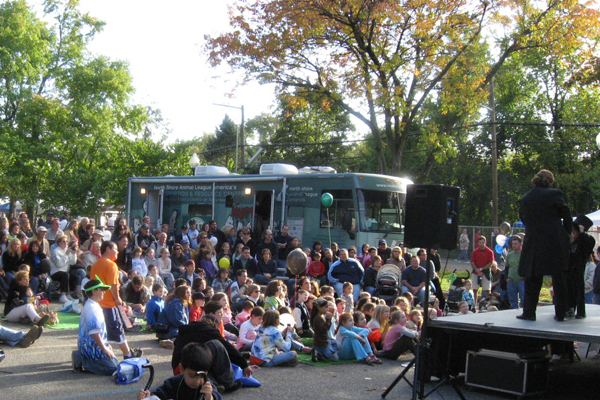 The following two projects are such examples. 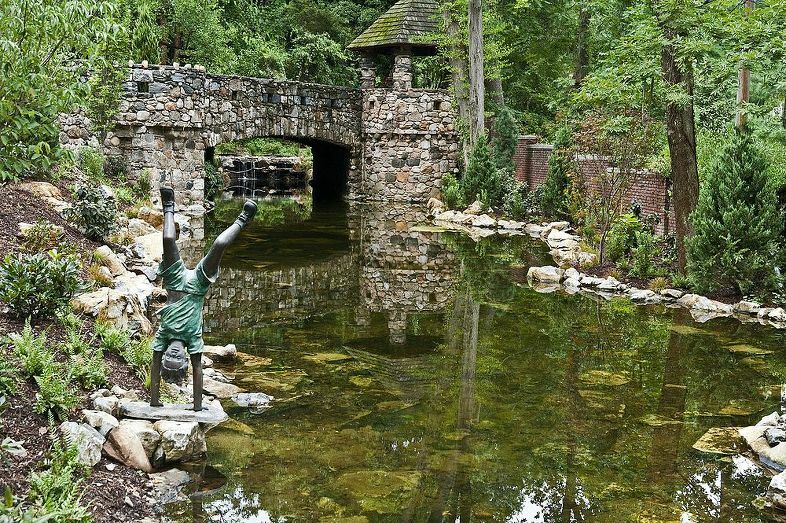 This vanishing edge pond, like this project’s second smaller pond, is more than a reflecting pond; it’s also a swimming pond — part of a pristine Deck and Patio backyard oasis that includes the two ponds, a stream, and waterfalls. (See also next 3 photos). Sunset is a magnificent time to mediate on the illusions created by the reflecting pond’s placid water. The water mirrors its surroundings so perfectly, it can be a challenge to tell the real sky, ocean, and landscape from their reflections. 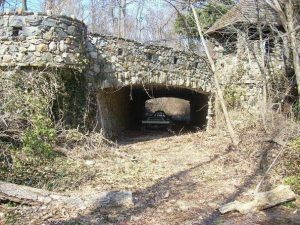 The smaller of the two ponds is just steps outside the homeowners’ back door. Note how beautiful the back of the house is captured in the pond and reflected back. During the day, stepping stones across vanishing edge pond bring you up close to the images created in the water. Bend down, gently pass your hand through its stillness, and watch the reflections ripple. 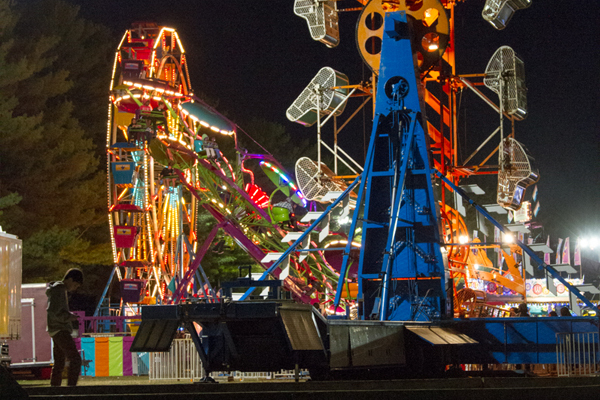 If there’s a better pastime, we’ve never come across it. 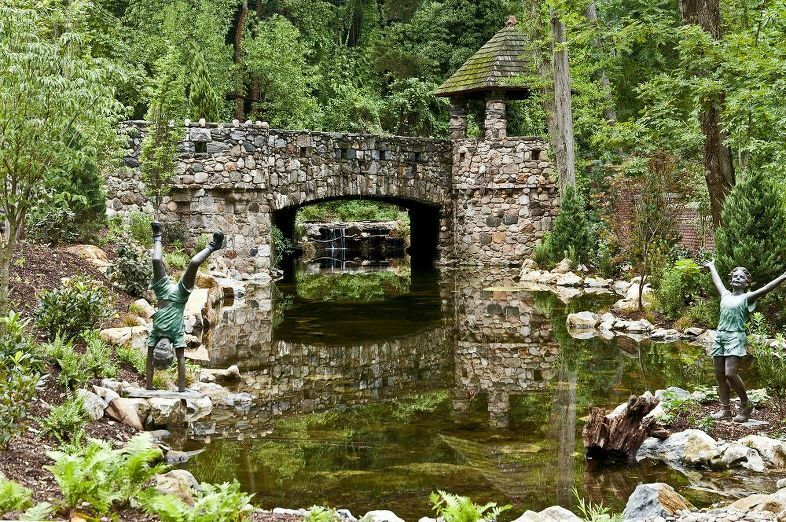 Landscape design is an essential element in bringing about beautiful reflections and peaceful scenes. Deck and Patio’s Bill Renter used Mother Nature’s own creations — plants, moss rocks, and the water itself, to design a true mystical experience for this project. Can Even a Deck Railing Reflect Your Personality? The Deck and Patio’s outdoor expert believes that even the humble deck railing can help showcase one’s personality. This is because, other than the specifications required in local building codes, there are few rules or requirements in choosing a railing. 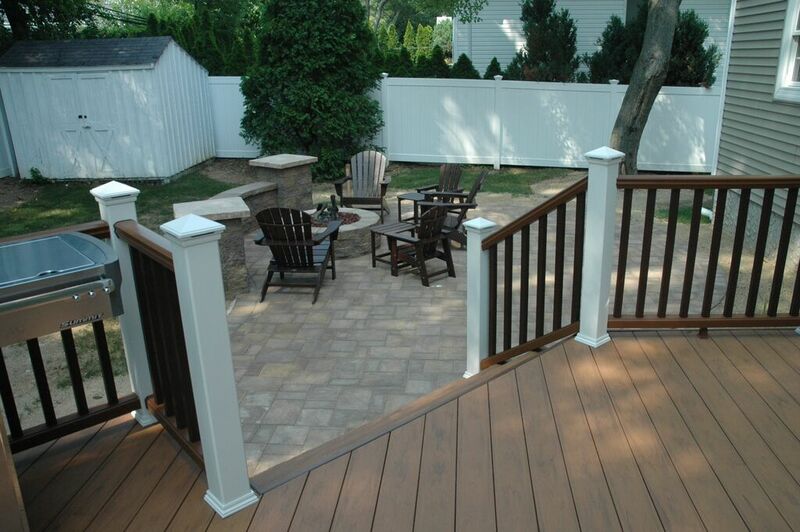 For example, a deck railing by no means has to match the deck. It just needs to coordinate with it. With all the different options available: baluster and post sizes, shapes, materials, and colors — and the freedom to mix and match — a railing is an easy way to express oneself. And when we do that? We’re rarely unhappy with the results. So homeowners might ask themselves: Are we people who cherish privacy? Or, are we nature enthusiasts who want the maximum view possible? Or, perhaps, are we traditional in our tastes. 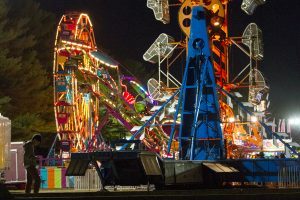 Yet, again, maybe, we prefer a bit of whimsy and like to let loose a little? Long Island deck builders, The Deck and Patio Company, helped these clients (see two photos above) add sophisticated drama by framing deck with TimberTech’s “Radiance Rail” railing. To give the sophisticated drama that best expressed their clients, Deck and Patio installed TimberTech’s “Radiance Rail.” Radiance Rail provides the ability to mix and match posts and balusters, and also offers a range of post caps. The ideal choice for these clients was a cap fitted with TimberTech’s recessed DeckLites. This extra outdoor deck lighting not only offered more nighttime safety but provided it in an understated style — perfect for these homeowners. In this case, lovely outdoor views were of primary concern to clients who are avid outdoor enthusiasts. Acting first as deck builders, Deck and Patio installed a two- story raised deck. And, as is often the case when building a deck, the homeowners also requested a spa. Deck and Patio helped the clients choose the ideal encasement for a new Bullfrog Spa that coordinated nicely with the deck planks and also integrated the spa harmoniously into the deck. 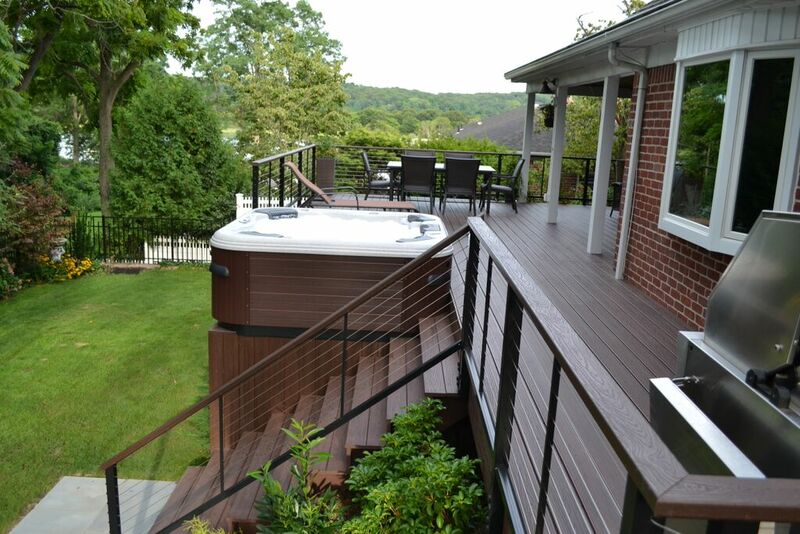 When it came to the deck railing, after all that had been accomplished, it was important that, when the clients sat on their new deck deck or relaxed in the hot tub, the railing infill would not spoil the exquisite views. To accomplish this, infills by “CableRail by Feeney” were chosen because these infills are almost unnoticeable. Trex Railing with black metal balusters was chosen by Deck and Patio for this installation because they hold up so well to the elements. 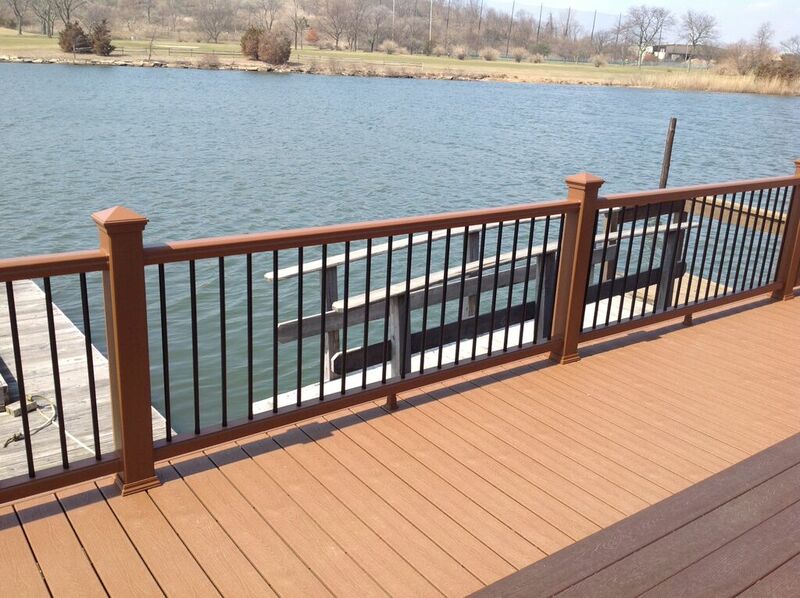 handsome Trex Composite Railing with black metal balusters that offered more than waterside security. 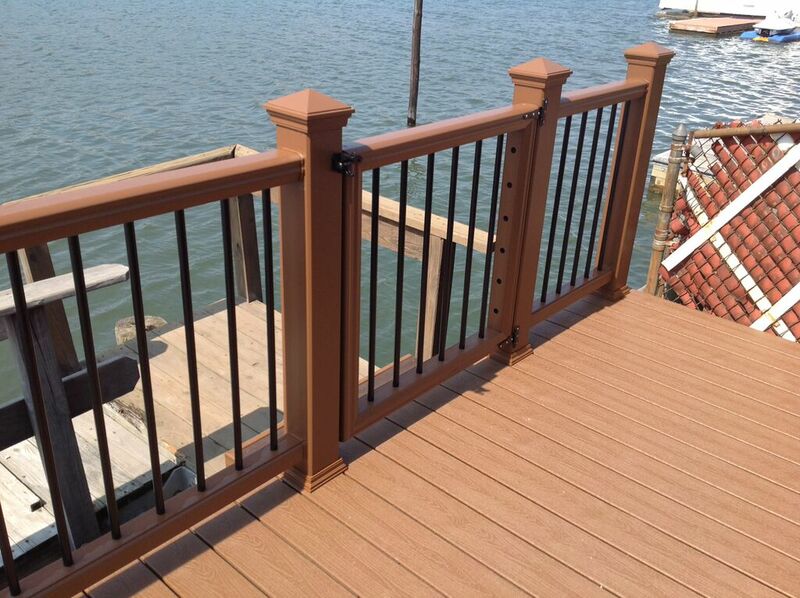 These railings offer protection from UV rays and will stand against damage from insects, water, or sun. Note: because the top rail (cap) of a railing is usually selected separately from the infill and posts, the cap presents special opportunity to be creative. You can go wild with color choices, materials and styles, Here’s a tip: Pick a wide top rail if you are a passionate gardener or you love to entertain. With a wider cap, you can easily rest small planters or drinks.